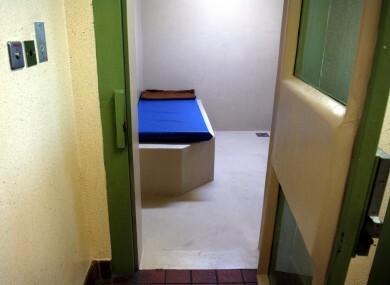 IRISH PRISONS HAVE kept nine prisoners in solitary confinement for over one year, new figures have revealed. The statistics, released under the Freedom of Information Act, have shown how the inmates have been kept in 22/23 hour lock-up for their own safety and the safety of the general prison population. Another nine inmates have spent between 201 and 365 days in 22/23 hour lock-up also. Earlier this month, Justice Minister Frances Fitzgerald described how the number of inmates being held in solitary had decreased from 211 to 74. This figure was comparing numbers from Jul 2013 to October 2016. According to the Irish Prison Service (IPS), the number of people on ‘restricted regimes’ increased by 22 in the past three months. Figures show that there has been an increase from 402 to 424, a rise of 5.5%. A restricted regime is where a prisoner is placed in custody away from the general population and spend a minimum of 19 hours behind bars. The number of those on a restricted regime for protection reasons was 378, of which 367 were there at their own request. There were 31 inmates on 22/23 lock-up, which represents a decrease of 43 on July 2016. However, Irish Penal Reform Trust (IPRT) acting director Fiona Ní Chinnéide said the number of prisoners on restricted regimes is slowly increasing again. She told TheJournal.ie: “The number of people who are being held for a minimum of 19 hours a day in their cells is actually increasing. “You can see the number of people in 22/23 hours confinement decreasing but, in general, the figure is slowly creeping up. “I know that many people are saying there has been a big reduction but those figures are being compared to July 2013. The Kinahan/Hutch gangland feud is also responsible for a surge in the number of people being placed in protective custody. Prison sources have said a number of inmates can’t be released into general population because they have a bounty on their heads. Others are too volatile or violent to be placed back in with other prisoners. A spokesman for the Irish Prison Service said they take the safety of the prisoners very seriously and guards give prisoners as much time out of their cells as possible. He told TheJournal.ie: ”The Irish Prison Service is obliged to ensure the safety of all prisoners. “There is a small cohort of prisoners who, for various reasons, need to be isolated for their own safety or for the safety of others. Email “Nine prisoners have been held in solitary confinement for over 12 months ”. Feedback on “Nine prisoners have been held in solitary confinement for over 12 months ”.